Wright State University–Lake Campus is proud to support an Advanced Manufacturing program for businesses, technicians, and students in West Central Ohio. Started in 2007 with a large grant from the Ohio Department of Labor, the Lake Campus along with three other schools created a consortium, wrote curriculum and set up lab space to train maintenance technicians working in manufacturing and food processing. The consortium dissolved in 2011 but WSU-Lake Campus continues to offer the popular program. SkillsTrac is a comprehensive industrial maintenance training program, designed for our rapidly changing manufacturing industry. This program is geared towards full-time adult incumbent workers working as a maintenance tech or incumbent workers in other fields who would like to work in the maintenance field. WSU-Lake Campus offers the SkillsTrac program as part of the coursework in the Associates of Technical Studies-SkillsTrac concentration. SkillsTrac is a blended program, offering online learning from ToolingU SME, a partner since 2009. Online classes can be taken anytime and anywhere with the hands-on validation labs taken at the Lake Campus. The program is composed of multiple skill modules and each module builds upon the skills learned in earlier modules or your actual work experience. Employers or employees can take individual modules if a certain skill set is lacking in the employee. Each module is composed of smaller certificated levels. The Green Fundamental Skills module includes three certification sections: Maintenance Basics, Mechanical Systems, and Print Reading & Measurements. For those who need to learn basic mechanical concepts before learning more skills. The Yellow Industrial Skills module includes three certification sections: Industrial Electricity, Motors & Motor Controls, and Pneumatics & Hydraulics. These are core courses in the curriculum. Obtaining these concepts can help you learn advanced levels more effectively and efficiently. The White Welding & Machining Skills module includes two certification levels: Basic Machining and Basic Welding. The basics will be covered to allow you more flexibility whether machining replacement tools or widgets and the basic welding you may need to weld a part or fix a welding machine. The Red Industrial Control Skills module includes two certification levels: Control Systems and Programmable Logic Controllers. The Red modules include more lab time in order to achieve optimum learning. The Blue Automation Systems Skills module includes two certification levels: Automation Systems and Robotics. These labs include working in small groups, classroom learning and hands-on labs. *The Gold Level is coming soon! We are currently upgrading equipment and curriculum to offer full CNC training, robotic welding, and robotic set-up and maintenance. 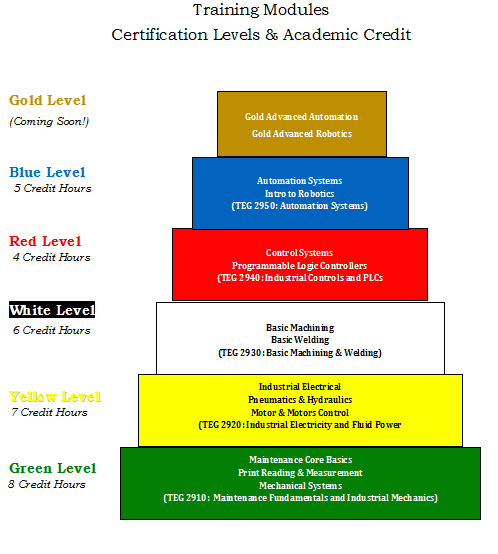 There will be two certification levels: Gold Advanced Robotics and Gold Automation Training. Successful completion of the SkillsTrac program can earn a student up to 30 credit hours that apply towards an associate of technical study. The associate degree requires approximately 60 credit hours to complete. View the associate degree requirements. Questions? Contact Academic Advisor Mark Hibner at 419-586-0377 or mark.hibner@wright.edu.